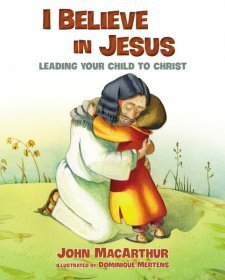 I Believe in Jesus By John MacArthur Published by Thomas Nelson is a new picture book featuring beautiful., bold pictures, that delivers the lifesaving message of salvation to young children. This large sized picture book is perfect for reading to a young child. It is like an outreach pamphlet but in a storybook format for children. The beautiful cartoon art by Dominique Mertens stands out from the usual cartoons seen in story books. The artwork is oprigonal and unique, especially the creation scene oon pages 6 and 7 depicting a view of the newly created earth from the vantage point of outer space. As far as the gospel message- it is simplified, yet true to God's word in explaining the gospel message of salvation. For those readers or older children wanting more information, biblical verses as well as references for more information are included. Parents and their children alike will enjoy this book. This is a crucial book. Unlike bible story books- this takes the bible's message further in delivering the life saving message of the Bible. Most bible story books fall short in this area and simply resemble a book of bedtime stories. As a blogger for Booklook I received a copy of this book from Thomas Nelson for the purpose of writing this review.